London was my "city trip" of the summer. As I live in a small town where there is suburbia and students (and not much in between), London is always a welcome change. The goal of my weekend was to meet up with friends, to get away to a large city, and to have fun. All were successfully accomplished. 1. 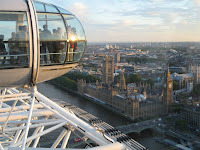 Riding the London Eye at sunset. The London Eye is the gigantic (135m tall) ferris wheel on the River Thames. Passengers ride in capsules. Sunset is my favorite time to go as you get to see London in daylight for the 1st half (15 min) and London lit-up by lights for the 1nd half (15 min). If you're lucky, there is a gorgeous sunset. If you want to impress a date, take them here. But expect to share the capsule with many other people... this means waiting patiently for others to move so that you can take your pics, or elbowing them out of the way. 2. Visiting the Princess Diana Memorial Fountain. This fountain is a small, circular stream with twists, twirls, and some small rapids. On warm days, hundreds of kids run in the stream. This is my favorite place to rest after a long day of walking. The water is reasonably chilled, which feels wonderful on tired feet. Beware: Prepare to get wet if you're anywhere near the stream. Kids are running and splashing everywhere. A friend and I tried to walk the entire circular loop of the fountain (with our pants rolled up). Being very dry, some little girls decided to splash my friend... then their friends joined in the splashing... then they got cups for water and super-soakers. Apparantely these little girls really liked him. And they showed it by ensuring that he was drenched in water when exiting the stream. 3. Visiting Camden (Camden St., Camden Market, & Camden Lock). Camden is an up & coming, edgier neighborhood in London. Day or night, this place is packed. Camden is made-up of 3 parts: Camden St, Camden Market and Camden Lock. Camden St. has great shopping. Small boutiques, featuring soon-to-be up & coming designers line the streets. At night, the street is alive with restaurants and bars. If you like flee markets, Camden Market is the place to go. It has stalls with cheaply made trendy clothes (think Forever 21) and mass produced items (like t-shirts). Only clothing, jewlerly, and shoes are sold here. The clothing selection here is better than many other flee markets that I've seen. If you don't like flee markets, avoid this place. The stalls are tightly packed and can make anyone clusterphobic. Camden Lock is my favorite part of Camden. It used to be a horse stable (hence the horse statues everywhere). Now it's home to up & coming designer boutiques (selling very edgy and very Indy clothing), boutiques selling random clothing (think great place to shop for Halloween costumes), and tons of food stands (with every type of food). At lunch, you can wander around, sampling different foods. When you decide where to eat, you can purchase a large box for £3-4 and fill it with all food that you want from that food stand. 4. Watching a football match at Wembley Stadium. One of my favorite things to do in when visiting a country is to watch a local, sports match. The crowd atmosphere at these matches tells a lot about the people in the country. Knowing that I love football, a good friend got us tickets to the England v. Mexico. As this was a pre-World Cup practice match, the atmosphere was even louder than normal. Everyone was decked out in England or Mexico colors. Almost everyone attending the match is a die-hard fan of their team... they attend both home and away matches of their team. It was during this match that I learned "Our Country Tis of Thee" was written to the tune of "God Save the Queen" (the British national anthem). Apparantely the British do not like the US lyrics and don't appreciate someone singing the US lyrics during the playing of their national anthem... they consider it butchering it. 5. Visiting Hyde park. When the weather gets warm, Londoners spend all day in parks. They're a great place to meet friends. It's completely common to see many groups still in the park at 9pm (the sun is still out at 9pm in summer). On another note, it's also completely common to see (almost) naked people, specifically guys, in the parks during hot weather. Many Londoners like to strip down when it's sunny with the purpose of getting a tan. This can be a scary sight, depending on the person with their clothes off.